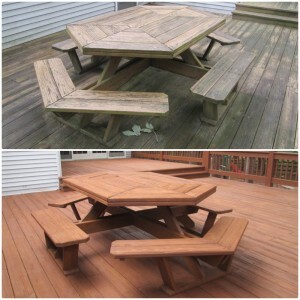 Puma professional exterior wood cleaning and restoration services are second to none. The top rated, highly trained professionals at Puma can transform your wood deck, patio, fence or structure to beautiful and enjoyable. Over time, unsealed exterior wood surfaces develop an undesirable appearance which takes away from its natural beauty. The undesirable appearance is a result of damage occurring. The same damage that results in the undesirable appearance also shortens the life of the structure or surface. Replacement costs are expensive and sending a valuable natural resource to the landfill is not ideal for the environment. Puma professional wood restoration provides the environmentally friendly and cost effective solution. Puma professional exterior wood stains are available in variety of beautiful colors. Our professional stains and sealants our extremely durable, environmentally friendly and provide lasting protection. Our professional wood stains and sealants resist the accumulation of dust, dirt and debris so your exterior wood surfaces stay cleaner longer. When it’s finally time to clean the sealed surface, it’s much easier and requires far less time. Restore beauty and regain enjoyment of your outdoor structures, while protecting your investment and the environment. Call us today for a free onsite estimate at 415-825-2559.